The task is to design and build an autonomous, microcontroller controlled mobile robot, which will correctly move the ketchup cans in the stock. Each time two opposite robots compete. The winner is who faster and better fulfill its task. 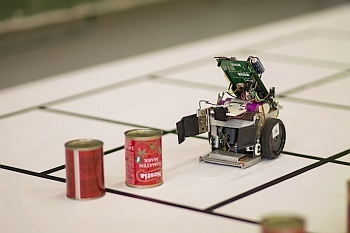 The robot task is to move as much ketchup cans as possible to its home line. 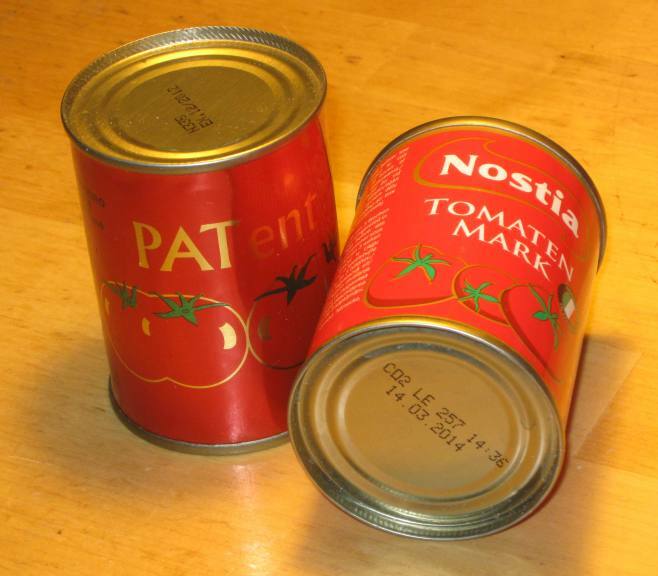 Ketchup is stored in a steel tinned can with diameter 53 mm (+/- 1 mm) and height 74 mm (+/- 1 mm). The mass of the full can (with the content) is approximately 163 grams (+/- 5 g). Tomato ketchup in can. Available in regular groceries. The stock is represented by the network of 5 horizontal and 5 vertical lines with the distance 30 cm (+/-1cm). Horizontal lines are numbered 1-5, vertical are labeled A-E. Lines are black, their width is 15 mm (+/- 1mm). Lines are meant as a navigational aid, it is not necessary to move along them. The base is horisontal, white. It's made of plastic, rubberized fibre or similar material. When the base will be not made of single piece, then the connections shouldn't create steps larger than 1 mm. Slope changes shouldn't exceed 4 degrees. At the start robots are placed on intersections A3 and E3. Vertical line A is called home line for the first robot, vertical line E is home line of the second robot. There are 5 cans in the game. 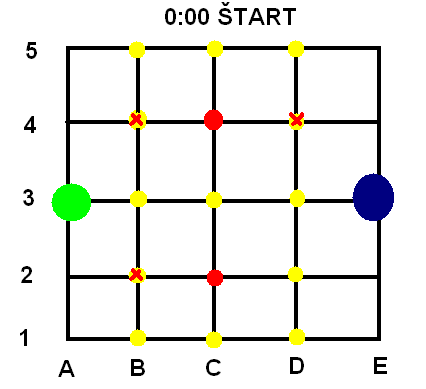 At the beginning, there are always two ketchups at the positions C2 and C4. Another three will be placed on some of the B, C or D colummnd such that two of them are always in center symetrical positions. Those three positions are choosed before the each run randomly. When the robot during the game moves the one from random positioned cans more than one square, on the empty place the another can will be placed by the jury. This will be done up to the total number of 12 cans. Robots are on positions A3, E3. Two cans are always at the C2 and C4. 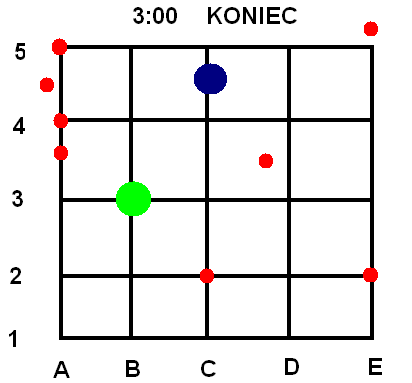 Another three are located on some of the yellow circles, e.g. B2, B4 and D4. Robot has to be autonomous. During the contest there is no external influencig allowed. Length and width of the robot has to be less than 30 cm. When the robot changes its dimensions during the contest, in any instant moment the dimensions can't exceed 30×30 cm. Height of the robot is not limited. Cans are not counted to the robot dimensions. Please, notice also the dimensions of the stock and place required for turns. It is allowed to move also apart from lines, they are considered just as a means for navigation. During the robots movement it cannot place any traces or markings. No part of the robot can stay on the base. The basic task is to identify cans in the stock and to move them beyound its home line. Is is allowed to move also the opponents cans. Damaging of the opponnents robot is strictly forbidden. Before the start, robots are placed on their initial positions. On the referee signal they are activated by owners who then immediately move back and no more interact with the robots. After the time limit are robots immediately deactivated by their owners. Cans can be moved using any technique (push, pull, roll,...). Also more than one can at the time can be moved. Robot may move in any direction, as the lines are meant just as a navigational aid. After the finish the number of cans on the home line is evaluated. The can is scored only when at least its small part touches the home line. It is not necesserily in the crossection. Number of cans in the home line represents score of the robot in a given lap. The contest will run in round robin tournament. In the case of large amount of participants the robots will be divided into the smaller groups. Green robot wins - it has 3 cans in his home line, while the blue one only 1. After the finish the robot can stop anywhere, not necesserily on his home line. Ketchups are counted after the finish. Until then, robots can them mutually "steal away". During the movements in the storehouse the robot should avoid the physical contact with the opponent as much as possible. It is important to not block opponent robot's movement. In fact this depends on the jury opinion, that will first warn the aggresive robot and in the case of the repeated collisions the robot will be disqualified. Contest sequence will be determined immediately before the contest based on the homologation. The homologation consists of the demonstration of robot capability to earn at least one ketchup can in time limit against the passive oponent. During the competition the opponent cannot be touched. Without homologation the robot cannot compete. Throughout the contest, the algorithms, settings, and components on the robot can be shaped, angled, or configured differently for facing each opponent. The robot must be ready within 1 minute after callm, otherwise its match is lost. Each match takes 3 minutes. If both contestants agree, the match can be stopped also sooner. Winner of the tournament is the robot with the highest score. If during the tournament no points will be scored, jury will determine the winner based on the overall succesfullness - e.g. how close was the can to the home line, whether the movement was coordinated or just random etc. The jury may also consider to award the most interesting or more beautiful constructions etc. And of course, all the common rules are valid. What is the size of the playground? Minimum 180x180 cm (30 + 4x30 +30). When my robot keeps the opponent from movement, will this be considered as a damaging it with the conscecutive disqualification? It is important to NOT mechanically block the opponent robot movement. The jury will first warn the contestant and in the case of repeated collisions the robot will be disqualified. How many cans can be taken at one movement? Will the can dimension counted to the total dimensions of the robot? Can I make a triggers in the stock? No. No traces, no markings. No subpart of the robot can be placed or leaved on the base. Do we have to push the can?